How do I buy an Epcon Communities Franchising, Inc. Franchise? Open Epcon Communities Franchising, Inc. in any of these available states: AK, AL, AR, AZ, CA, CO, CT, DC, DE, FL, GA, IA, ID, IL, IN, KS, KY, LA, MA, MD, ME, MI, MN, MO, MS, MT, NC, ND, NE, NH, NJ, NM, NV, NY, OH, OK, OR, PA, RI, SC, SD, TN, TX, UT, VA, VT, WA, WI, WV, WY. 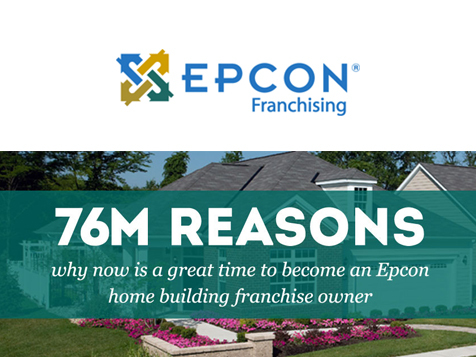 Epcon Communities Franchising Inc. is America’s 36th largest homebuilder (“2013 Builder 100,” Builder Magazine, May 2014), and one of the only home building franchise companies that exists. Epcon and its Franchise Builders develop communities of ranch-style, maintenance-free homes popular with 55+ buyers — a demographic that is projected to drive new home sales in the United States for many years to come. Since 1986, more than 28,000 homes have been built by Epcon and its Franchise Builders — but that doesn’t even scratch the growing demand for maintenance-free communities. The rest of the homebuilding industry is far behind Epcon in its efforts to appeal to this growing demographic. Epcon recently partnered with Metrostudy (a division of Hanley Wood) and Builder Magazine to analyze the supply and demand for housing, and the results were striking. Metrostudy projects a shortfall of hundreds of thousands of homes for Baby Boomers who are looking to downsize into condominium-style communities. The dramatic shortage in desirable housing creates a massive opportunity for Epcon Franchise Builders. The U.S. Census Bureau reports that 76 million Baby Boomers were born from 1946 to 1964, and their retirements will continue driving demand for the next 15 years, with Generation X (b. 1964 to 1982) then driving demand. Even more striking, Metrostudy expects 55+ buyers to account for 52 percent of new home sales over the next five years. Private equity firms, smart entrepreneurs and small business people of all types recognize that there is a huge opportunity to serve the needs of the growing senior market. But home building is a highly nuanced business, and creating planned development communities is even more nuanced. It requires expertise that takes years to develop. It also requires individuals with enough capital to invest in development and sales. The high cost of entry, combined with that necessary amount of knowledge and skill, keeps competition at bay. High customer demand, low competition and high barriers to entry typically create a situation where new competition is slow to respond. Savvy investors will capitalize on that situation and create a long-term, profitable and sustainable niche. While would-be competitors are still scrambling to get off the ground, existing players should use their people, knowledge and resources to charge hard and maximize their returns. Epcon lowers the barriers to entry. Epcon Franchise Builders receive training and support that helps them meet this demand. They learn the core strategies and processes for developing communities; benefit from leading-edge training and tools for marketing and selling homes; get access to industry leaders in all aspects of home building; and obtain access to the insider knowledge of a national builder willing to share its bookkeeping with Franchise Builders to help them gauge costs and maintain margins. Home building experience is not necessary to become an Epcon Franchise Builder. Detailed processes provided by Epcon enable investors to efficiently build and sell homes, while our marketing resources make it easier to pre-sell homes prior to breaking ground. That, in turn, helps developers speed their return on investment. To start building an Epcon community, your team will need at least $500,000 in liquid capital, a net worth of $1.5 million and the ability to secure a construction line of credit of $5-6 million or more..
Epcon’s founders have a passion for great architecture and designing homes that live well, and our home and neighborhood designs are the result of years of development with the best designers in the industry. Everything is meticulously thought out. Our award-winning designs also incorporate intense research and development. Prior to designing our recent Courtyard Series of homes, more than 6,000 buyers were surveyed to ask them what features they wanted in a new home. We developed a wish list — then we gave those specs to leading architects around the country and asked them to create their best designs at various home sizes. The result was award-winning layouts that buyers love. Survey participants expressed an affinity for outdoor living and recreation, as well as a need for privacy. So, each Courtyard home features a beautiful interior that benefits from light that floods into the living areas of the home from an outdoor courtyard that is perfect for entertaining or simply enjoying a morning coffee. The private outdoor living space is visible from all main rooms in the house. The open floor plans combine the kitchen, dining and living spaces to give the home an overall feel of openness and light. Each community also typically features a gathering place — a swimming pool, fitness center or clubhouse, that makes it easy for friends and neighbors to meet up, as well as walking trails in many communities. Our communities are also close to local shopping, dining and entertainment. Our maintenance-free homes and communities are designed to give people the freedom to have fun, with plenty of amenities and few of the chores of home ownership. 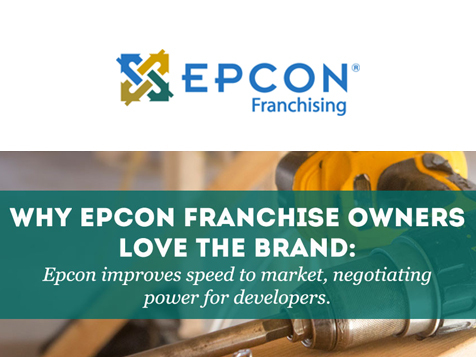 As an Epcon Franchise Builder, you will have the tools and the guidance you need to appeal to a growing base of buyers. Terry Neer, who builds Epcon Communities near Indianapolis, says that he likes knowing that Epcon isn’t just a franchisor, that we are a very active homebuilder with a lot of skin in the game ourselves — and we share what we know. Epcon Communities Franchising, Inc. is not currently active in our directory, but here are some other recommended selections for you to explore.